Brand new high quality 6 size revolving leather belt hole puncher! Perfect for belts, leather, textiles, soft plastics, canvas, etc! Super easy to use. Super comfortable and easy to use! Hand held leather hole puncher. 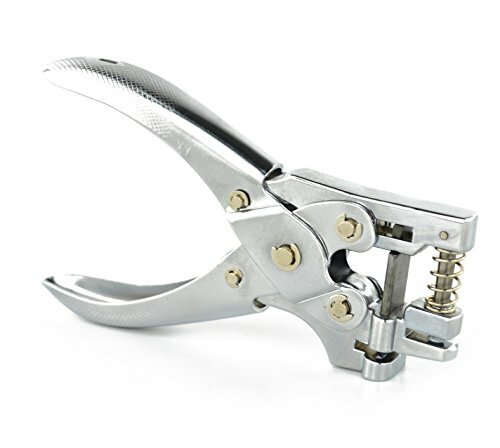 E2BUY Professional Heavy-Duty Leather Hole Punch, designed to make light work of tough jobs. works on all types of materials such as leather, rubber, cotton, cards, fabric, paper etc. 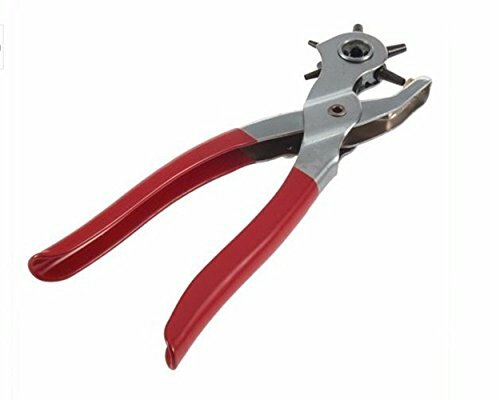 Our product adopts double lever labor-saving design and Sharp notch, much less strength and push required than with other tools. With the free ruler that comes with it you will get accurately spaced holes. Note: Please put the spare plates under the leather belt so as to make it easy to be penetrated. The General Tools and Instruments 1271O Arch Punch is the ideal punch tool for punching a 1-1/4 inch hole. The punch works on leather, rubber, canvas, plastic, sheet metal, gasket material, cardboard and softer metals. The internal punch features an inside taper for clearance. The punches are heat treated forged steel, ensuring long lasting performance. Because of this heat treatment, the cutting edge will stay sharper longer. GENERAL TOOLS - THE PRECISE TOOL FOR DOING THE JOB EXACTLY RIGHT. Offering over 1,000 tools, we re proud to provide tradesmen, craftsmen and DIYers around the world with a broad range of affordable, specific-purpose mechanical hand tools and precision measuring and inspection tools. This heavy duty hand held corner rounding tool with 2.5mm radius weighs under 14 ounces & cuts up to approx 5/64" thick (75 mils) paper, PVC cards or laminated paper material. 2.5mm radius is approximately 3/32 of an inch. Has large steel cutting blade and extra wide side guides to make seating your sheet simple and efficient. This has become the tool of choice for many game counter clipping users. This small radius was requested to remove sharp corners without disturbing printed info. Insist on Authentic Oregon Lamination Premium Tools. You'll be glad you did. The General Tools and Instruments 1271M Arch Punch is the ideal punch tool for punching a 1 inch hole. The punch works on leather, rubber, canvas, plastic, sheet metal, gasket material, cardboard and softer metals. The internal punch features an inside taper for clearance. The punches are heat treated forged steel, ensuring long lasting performance. Because of this heat treatment, the cutting edge will stay sharper longer. GENERAL TOOLS - THE PRECISE TOOL FOR DOING THE JOB EXACTLY RIGHT. Offering over 1,000 tools, we re proud to provide tradesmen, craftsmen and DIYers around the world with a broad range of affordable, specific-purpose mechanical hand tools and precision measuring and inspection tools. The General Tools and Instruments 1271Q Arch Punch is the ideal punch tool for punching a 1-1/2 inch hole. The punch works on leather, rubber, canvas, plastic, sheet metal, gasket material, cardboard and softer metals. The internal punch features an inside taper for clearance. The punches are heat treated forged steel, ensuring long lasting performance. Because of this heat treatment, the cutting edge will stay sharper longer. GENERAL TOOLS - THE PRECISE TOOL FOR DOING THE JOB EXACTLY RIGHT. Offering over 1,000 tools, we re proud to provide tradesmen, craftsmen and DIYers around the world with a broad range of affordable, specific-purpose mechanical hand tools and precision measuring and inspection tools. The General Tools and Instruments 1271I Arch Punch is the ideal punch tool for punching a 3/4 inch hole. The punch works on leather, rubber, canvas, plastic, sheet metal, gasket material, cardboard and softer metals. The internal punch features an inside taper for clearance. The punches are heat treated forged steel, ensuring long lasting performance. Because of this heat treatment, the cutting edge will stay sharper longer. GENERAL TOOLS - THE PRECISE TOOL FOR DOING THE JOB EXACTLY RIGHT. Offering over 1,000 tools, we re proud to provide tradesmen, craftsmen and DIYers around the world with a broad range of affordable, specific-purpose mechanical hand tools and precision measuring and inspection tools. The General Tools and Instruments 1271G Arch Punch is the ideal punch tool for punching a 5/8 inch hole. The punch works on leather, rubber, canvas, plastic, sheet metal, gasket material, cardboard and softer metals. The internal punch features an inside taper for clearance. The punches are heat treated forged steel, ensuring long lasting performance. Because of this heat treatment, the cutting edge will stay sharper longer. GENERAL TOOLS - THE PRECISE TOOL FOR DOING THE JOB EXACTLY RIGHT. Offering over 1,000 tools, we re proud to provide tradesmen, craftsmen and DIYers around the world with a broad range of affordable, specific-purpose mechanical hand tools and precision measuring and inspection tools. The General Tools and Instruments 1271C Arch Punch is the ideal punch tool for punching a 3/8 inch hole. The punch works on leather, rubber, canvas, plastic, sheet metal, gasket material, cardboard and softer metals. The internal punch features an inside taper for clearance. The punches are heat treated forged steel, ensuring long lasting performance. Because of this heat treatment, the cutting edge will stay sharper longer. GENERAL TOOLS - THE PRECISE TOOL FOR DOING THE JOB EXACTLY RIGHT. Offering over 1,000 tools, we re proud to provide tradesmen, craftsmen and DIYers around the world with a broad range of affordable, specific-purpose mechanical hand tools and precision measuring and inspection tools. Ideal for punching round holes in gasket material, leather, rubber, canvas, cardboard, plastic, sheet metal and other soft materials. 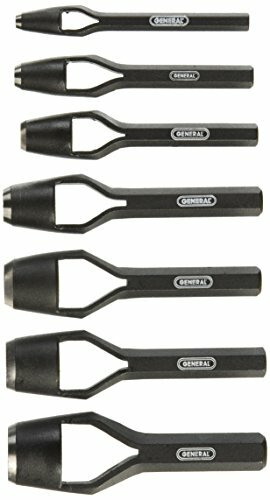 GENERAL TOOLS - THE PRECISE TOOL FOR DOING THE JOB EXACTLY RIGHT. Offering over 1,000 tools, we re proud to provide tradesmen, craftsmen and DIYers around the world with a broad range of affordable, specific-purpose mechanical hand tools and precision measuring and inspection tools. 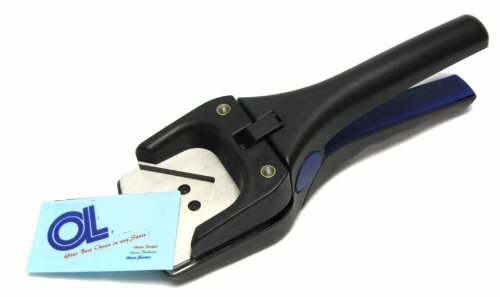 This heavy duty 2mm radius hand held corner rounding punch weighs under 14 ounces & cuts up to approx 5/64" thick (75 mils) paper, PVC cards or laminated paper material. This punch large steel cutting blade and extra wide side guides to make seating your sheet very simple. This is the deluxe tool of choice for many game counter clipping users. The tiny radius takes just enough off to remove sharp corners without disturbing printed info. Our heavy duty steel 2.5mm radius corner rounder punch cutter with coated grips has become a desirable hand held tool for wargame counter clippers and crafters alike. This small radii is approximately 3/32 inch and removes just enough corner material to eliminate sharpness. 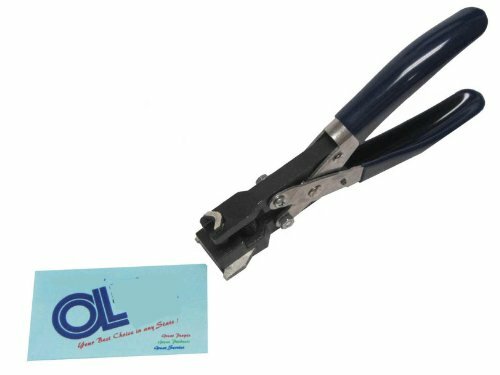 Tool weighs under 11 ounces & cuts up to approx 1/16" thick (70 mils) paper, PVC cards or laminated paper material. Beware of sellers piggy-backing on this listing; whereas, authentic Oregon Laminations Premium quality products are only available from Oregon Laminations Company. This heavy duty hand held corner rounding tool with 5mm radius weighs under 14 ounces & cuts up to approx 5/64" thick (75 mils) paper, PVC cards or laminated paper material. 5mm radius is approximately 7/32 of an inch. Has large steel cutting blade and extra wide side guides to make seating your sheet simple and efficient. This radius is common on the corners of many playing cards. This tool is built to last a long time. These heavy duty magnet hooks attach to appliances, cabinets or any other metal surface to provide a convenient hanging spot. These zinc-plated magnetic hooks resist rust and corrosion making them ideal for long term use. Able to hold 4-3/4 lbs. of weight. Brand new and high quality. This puncher can punch cardstock, chipboard, photo, ID cards, restaurant POS cards etc. 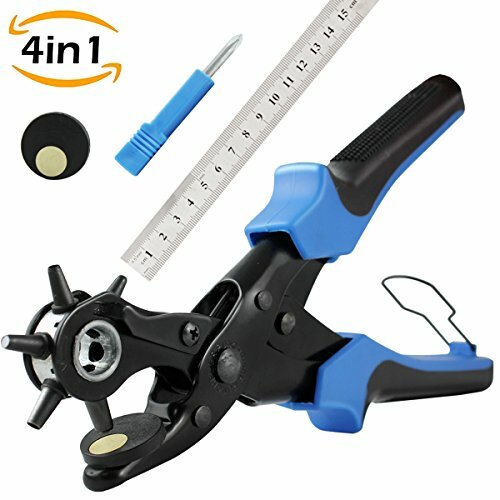 Package included: 1x slot and hole punch Plier Tool. Material: durable zinc alloy with chrome coating. High-strength, drop-forged steel arch punches perfect for creating precision-size bolt holes from 3/16"to 2". Arch design safely transmits impact force from the punch handle to the cutting head. Finely-honed cutting edge cuts gasket material cleanly. Cutting head features inside taper to quickly and effectively clear punching's. This heavy duty hand held corner rounding tool with large 10mm radius weighs under 14 ounces & cuts up to approx 5/64 thick (75 mils) paper, PVC cards or laminated paper material. 10mm radius is 3/8 of an inch. Has large steel cutting blade and extra wide side guides to make seating your sheet simple and efficient. This large radius is best suited to larger sheets like letter size and for arts and crafts. -> PLEASE READ: Be sure In Stock says: sold by Oregon Laminations Company. Otherwise, you are not getting Authentic Oregon Lamination Premium quality Corner Rounder as listed; however, you can choose the #new from link to find the Only True Source of OLP fine Corner Rounders.-> PLEASE do NOT post bad rating for this Corner Rounder when you purchase from other sellers Piggy-Backing on this listing who must substitute a Corner Rounder of their choice. This unfairly harms the reputation of these fine OLP Corner Rounders. Thank you in advance for understanding. 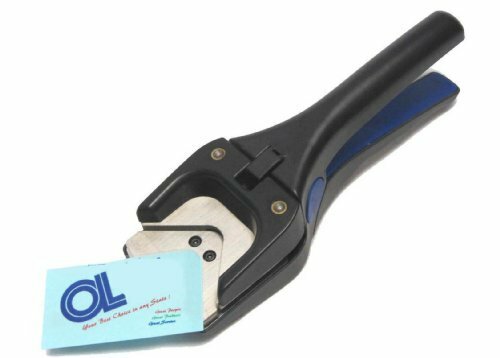 This heavy duty hand held corner rounding tool with 3mm radius weighs under 14 ounces & cuts up to approx 5/64" thick (75 mils) paper, PVC cards or laminated paper material. 3mm radius is approximately 1/8 of an inch. Has large steel cutting blade and extra wide side guides to make seating your sheet simple and efficient. This has become the tool of choice for many game counter clipping users. This radius is typical on the corners of most credit cards in your wallet. Quality tools from C.S.Osborne. Crafted in the USA, built to last.